Thank you for your faithfulness in giving to the Lord through First Bible Baptist Church. Your tithes and offerings allow us all to expand God’s Kingdom here in the local Rochester area and around the world as we endeavor to Love God, Love People, Serve others and Tell Everyone! If you forgot your username or password, you can request it by clicking here. Once logged in, click on the “Give” button found on the side menu bar. Click on the “Schedules/History” sub menu then click “Giving Statement”. Set the statement type to “Family”. Set your Date Range to “Last Year”. 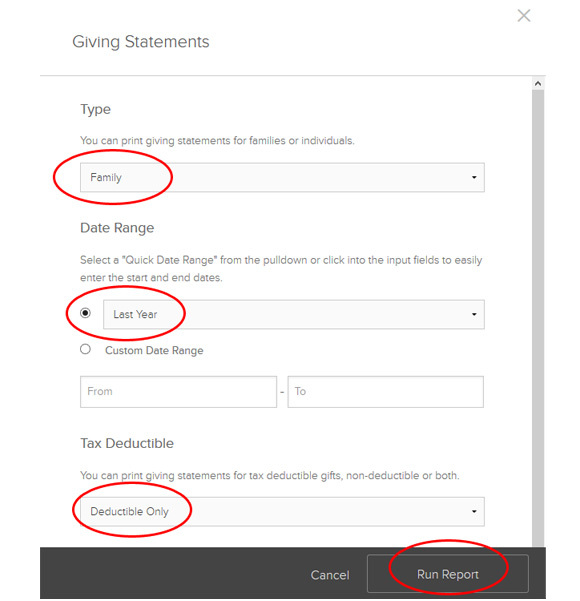 Set your Tax Deductible Option to “Deductible Only”. PLEASE NOTE: In order to see the “Family” statement you must be logged in as the “Primary Contact” of your family. If you do not see the option to choose “Family” as your statement type, you may need to login with your spouse’s (or parent’s) login. If you have any questions about accessing your giving statement online, or If you have any questions regarding the accuracy or your statement, please contact us here. If you are not able to complete the above steps and would like an emailed copy, we would be happy to accommodate. Just let us know. Thank you again for your investment in the Kingdom of God here at First Bible Baptist Church. It continues to pay dividends in the lives of those who we are able to reach and minister to for the cause of Christ.